We're standing together and taking action to create a gender equal world. HeForShe wants every voice to be heard in classrooms and corner offices around the world. Everyone has a say. Everyone has a role. Every unique contribution is essential to achieving gender equality. HeForShe is not just talking about gender equality. We’re achieving it by mobilizing our advocates to stand together, spread the word, and change the world with real action. The HeForShe logo unites traditional icons of gender to create a new symbol for our shared humanity. Its dynamic shape and strong contrast remind us what’s possible when unique individuals stand together for the benefit of all. 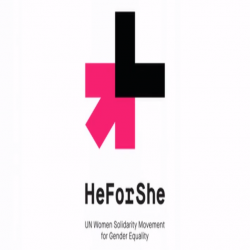 UN Women worked with Pantone Color Institute to find a color that expresses the passion and excitement of HeForShe. In the magenta family, pink radiates youthfulness and energy and redder hues voice a call to action. Bright and bold, HeForShe Magenta unites both ends of this spectrum – the ideal color to represent the solidarity movement for gender equality. *UN Women A Solidarity Movement for Gender Equality.